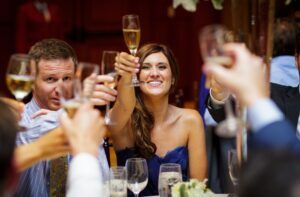 Don’t Overlook Your Rehearsal Dinner! This pre-wedding tradition is often the first time that many of the important people in the bride and groom’s lives are all together. It’s a time to celebrate the couple, reflect on their lives, and make memorable speeches. Since these moments are so unique and may not happen again, Allure Films urges all couples to consider having the rehearsal dinner professionally filmed! Guests are in their element at the rehearsal dinner, since it is not as formal as the wedding reception, so people giving speeches are much more comfortable. Rehearsal dinners are much smaller than the reception, which makes the evening more intimate. Speaking among close family and friends is different from speaking to a large room full of guests which allows for more candid moments to be caught on film. This is one of the only occasions that couples will have close friends and family share stories about them specifically. The rehearsal dinner is consistently the most emotive and joyful occasion for the couple. The night can be full laughter as well as beautiful tears, which are unforgettable moments that can be reflected in your wedding story. The dinner is a great opportunity for our videography team to build rapport with your family and friends so that on your wedding day, everyone is comfortable. Want the professionals at Allure Films to create your rehearsal dinner video? Contacts us today for more information and availability!